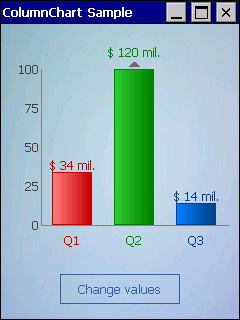 ColumnChart is a great .NET Compact Framework control to visualize series of data. Reporting is an important part of different types of processes – business, technical, social or entertainment. 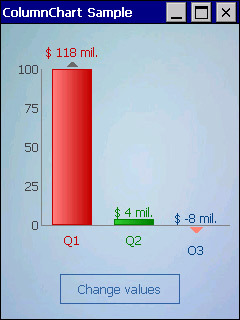 With ColumnChart your reports will be visually attractive, readable and easy to set-up. Full Visual Studio Designer support lets you see the whole report during design-time where you can customize it in accordance with the requirements of your application.